This tutorial is intended for ABAP webdynpro developers working in SRM7 with good knowledge on FPM. Most of the requirements we encounter in projects involves modifying web ui components. Almost all of the applications in SRM are built based on ABAP webdynpro FPM. Modifying FPM based applications is bit different than modifying normal ABAP webdynpro applications. In the coming sections we will see different methods of achieving this. If you are familiar with ABAP webdynpro but not with FPM go through the below docs and elearning material first. Go through the below excellent e learning material on SDN. Basically there are three ways of modifying the PO FPM elements depending on the requirement. 1. If you want to hide/remove MAIN/SUBVIEWS or indivudual UIBBs contained in them and you want to make these changes visible across all roles then enhance the standard component configuration and make the necessary changes. DATA : lo_ref TYPE REF TO cl_wd_transparent_container. lo_ref ?= view->get_element( 'LEFT_CONTAINER' ). IF lo_ref IS NOT INITIAL. lo_ref->remove_child( id = 'PO_NUMBER_LABEL' ). lo_ref->remove_child( id = 'PO_NUMBER' ). 3. If you want to hide/remove/add MAIN / SUBVIEWS based on some logic, then you have to follow the method I mentioned below. First let’s look at the standard purchase order display screen and understand the difference components and configurations that it uses. Now go to component FPM_OIF_COMPONENT from SE80 and locate the application /SAPSRM/WDA_L_FPM_OIF. This application will have different application configurations associated with it. We need to figure out which application configuration is getting called at run time. To know this we need to go to PFCG and see the Employee role, go to ‘display purchase order’ webdynpro application and click on details button. Click on ‘Create’ button to go to the individual component configuration view. The component configuration that is currently used by application is displayed there. We need to create an enhancement for this component configuration as well and use it in the apllication configuration enhancement. To create enhancement for component configuration /SAPSRM/WDCC_FPM_OIF_PO_PURCH, expand the component configuraiton section of FPM_OIF_COMPONENT and locate the configuration /SAPSRM/WDCC_FPM_OIF_PO_PURCH. start the configurator and select ‘create enhancemnet’ from the ‘other functions’ button dropdown. Enter any name starting with Z or Y and select OK. save the configuration. 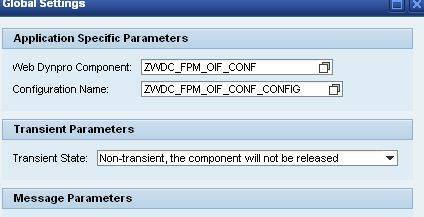 Now replace /SAPSRM/WDCC_FPM_OIF_PO_PURCH with the Z component configuration that we just created. After this is done click on ‘go to compoent configuration’ and select ‘change’ -> ‘global settings’. you will see under ‘application specific parameters’ , webdynpro component and confguration used for AppCC. we need to create our own custom AppCC component by copying the standard WD component /SAPSRM/WDC_FPM_OIF_CONF and component configuration /SAPSRM/WDCC_FPM_APPCC_PO_PURCH. Go to se80 and create both ( configuration can not be copied. so just look at the standard configration /SAPSRM/WDCC_FPM_APPCC_PO_PURCH and creata Z configuration similar to it ). Once we have created the custom AppCC component and configuration, replace the standard AppCC component and configuration with custom ones. Ok… we are done with the enhancement part . As we have created a custom AppCC component, we can now add/remove main/subviews as we want. let’s look at a simple scenario. The requirement is to change the name of the ‘Header’ mainview to ‘Header after change’ and remove the subview ‘Budget’ from the mainview ‘Header’ and also add a new subview with name ‘ FPM is Cool’ which holds a custom component ( YTEST ) as an UIBB. The above requirement can be achived by just changing the custom component configurationZENH_SAPSRM_WDCC_PO_PURCH that we had created earlier. But what if we need to do that based on some logic, we need a place to write the code. This is where the interface method OVERRIDE_EVENT_OIF of AppCC component comes into picture. Go to the component controller of component ‘ ZWDC_FPM_OIF_COMP ‘ and open the method OVERRIDE_EVENT_OIF’ and write the below code at the end. lt_uibb TYPE STANDARD TABLE OF ty_s_uibb . *remove subview 'Budget' under main view Header . This is how PO screen looks after the code change. Header description is changed, ‘Budget’ subview is removed and there is a new subview with name ‘ FPM is Cool’ added. I hope this tutorial will be of some help to ABAP webdynpro developers working in SRM 7.
would really appreciate help… and Also i would like to thank for all the information you are providing on SAP Webdynpro ABAP training.